I screwed the belts at the points (I forgot to erase the chalk lines before the pictures, but did before I sold them.). 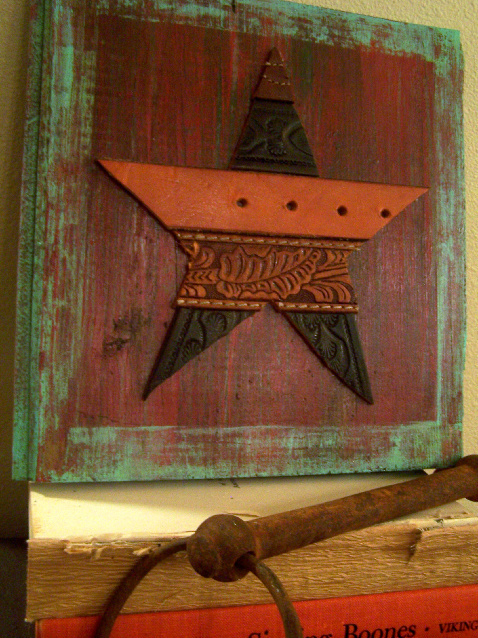 This one is on is on a cupboard door--part of my reclaimed wood stash. It will be used in a home similar to a Ronald McDonald Home in Missoula, MT. I also made one on some reclaimed barn wood I joined together. Love the very Montana, western belt across the middle. Great stars Becky! I love the reclaimed wood you used! Those are really creative! Very Western looking certainly! This is super adorable! Hubby goes through belts like crazy. I'll have to save them! OK... pinning the belt star. Completely clever and cute reuse of old belts.